Habanero growing shrub‎ of the genus Capsicum also known as Habanero pepper or Chili pepper, Habanero perennial evergreen but can grow also as annual plant, can grow in tropic, subtropical, mediterranean, temperate or desert climate and growing in hardiness zone 10b+ as perennial 2+ as annual. Habanero pepper from Mexico the scoville heat units ranging from 100,000–350,000. The hottest Habanero to date is the Red Savina pepper with a score of 577,000 units on the Scoville heat scale. 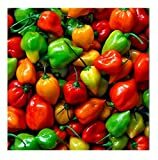 What can be done with big quantities of Habanero fruits? Chocolate Habanero also known as ‘Congo black’ – an outrageously hot Habanero that ranks among the hottest on the heat scale registering at 450,000 SHU. The fruits ripen from emerald green to a beautiful chocolate color. Caribbean Red Habanero – one of the hottest habaneros (445,000 Scovilles) that also has great flavor and twice the heat of most Habaneros. The pepper matures from green to bright red. 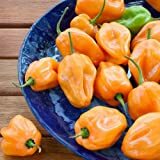 Big Sun Habanero is a large Habanero from Africa that matures from green to a yellow and has a very fruity flavor with the same scorching heat of its other habanero relatives. Mustard Habanero is a unique strain of chile that starts out green-purple and matures to a distinctive mustard color. They are rated at a similar heat level as that of the regular habanero. 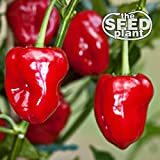 Peach habanero – a very productive variety on a compact plant which makes it ideal for inside growing. Peruvian White Habanero – a rare version of the White Habanero that originates from Peru. 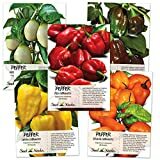 The plants are very productive and the fruits are extremely hot, often hotter than the regular orange habanero.